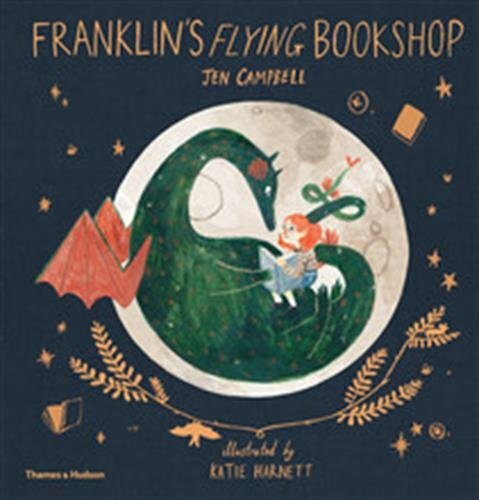 Franklin’s Flying Bookshop is an easygoing narrative about sharing the love of reading with friends. This light-hearted tale offers a novel, fantastical take on the idea of the bookmobile. Most of the dragons in fiction books are tough, fire-breathing, people-scaring, and powerful nemeses. Which is why Franklin, our protagonist dragon, is typically reading to bats, mice, and fireflies inside his cozy cave on the outskirts of town. Franklin is a reader through and through with stories and books covering his home and floating around his mind, but he struggles to find a more interactive companion than bats and mice. Each time he approaches human civilization, people hide, become startled, run for their lives, or otherwise avoid interaction. When he encounters a young lady, Luna, something sparks between them and things begin to change. They talk books, and books, and books. While trading their favorite stories and characters, Franklin and Luna find they have a common goal. Both dream of taking books out into the world for others to enjoy. They brainstorm and enact a plan to do so. With a bookshelf, sofas, firefly lanterns, and snacks securely tied to Franklin’s back, the pair flies into town to meet and great the townsfolk. Luna serves as a people ambassador of sorts to calm the fears of Franklin’s presence and explain why they have come; however, she is more confrontational then necessary. She makes a stern declaration almost daring people to mess with the dragon. There is some confusion as to what their intentions are. It takes acrobatic bats, singing mice, and cake before a few intimidated customers climb up onto Franklin and settle in on the sofas. Franklin goes a step further and even offers to fly these brave souls closer to the bright reading light of the glowing moon. The End. Book lover outcast meets book lover innocence. The two team up. There is not much else going on; this is a pretty straight forward, gentle story. Some random story choices pop up which at first seem important, but then fail to manifest into anything further. “Luna and Franklin feel like they are made out of stories.” Is one such statement, intriguing, but not pursued. Another occurs when the two friends are landing in the town. The text says that Luna shouts at the townspeople with “a fierce look in her eyes.” Why is she so defensive and angry at the frightened crowd? Why is it necessary to create a standoff between her and Franklin versus the people? The dynamic seems a misplaced fabrication, and is then dropped. The illustrations, while entertaining, simply follow along with the flow of the story. Harnett uses the same styles, colors, layouts, designs as she employed in Ivy and the Lonely Raincloud, even Luna is a red-headed, white-skinned version of Ivy. The illustrations are certainly sweet, but there is nothing else in them that contributes to the plot or the characters that isn’t already told in the text. In the end, though, the love for books remains crystal clear and front and center. Luna and Franklin do indeed care about sharing stories with their community. A little magical fantasy goes a long way in achieving that purpose.